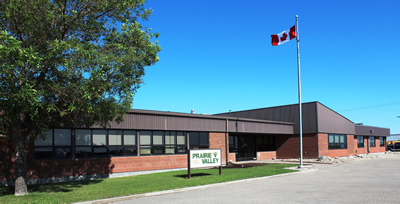 ​Approximately 1,300 Education Centre and school-based staff support Prairie Valley schools and deliver diverse programming to meet student needs. This includes 129 staff in the Education Centre, over 550 teachers and other staff including educational assistants, principals, bus drivers, caretakers and administrative assistants. Interim Director of Education/CEO, Randy Fox, reports to the Board and is responsible for the administration of Prairie Valley School Division. The Director is supported by a team of senior leaders in the Administrative Consortium. Luc provides leadership and direction in Prairie Valley School Division. He supports employees in achieving the Division's priorities laid out in the Board's strategic plan. His vision is to see that every student has a meaningful school experience and is provided with the opportunity to succeed and ultimately achieve the aspirations they hold. Luc oversees the business operations of the School Division in accordance with legislation, regulations, Board policies and Ministry of Education requirements. He is accountable to the Board and is supported by the Deputy Director/CFO and other senior leaders representing portfolios in Instruction and School Operations, Division Services and Human Resources. Naomi is responsible for non-instructional support services including finance, facilities, transportation, information technology and communications and human resources. Naomi also acts as Secretary to the Board, ensuring that Board meetings and business proceed smoothly and meet all legislative requirements. She works closely with the Director of Education/CEO to chart Prairie Valley School Division's future growth and strategic responses to a challenging and ever-changing environment. Superintendents of Education provide instructional and operational leadership and management oversight to the 39 schools in Prairie Valley. Key responsibilities include supervising school operations, analyzing and responding to school and system student performance data, and overseeing school-based staff recruitment, management and development. Mike is responsible for home-based education, extra-curricular, graduation and distance learning and shares responsibilities for administrator meetings and academies as well as for programming. Mike supervises the following schools: Balcarres, Bert Fox, Cupar, Fort Qu'Appelle Elementary, Kelliher, Lipton and Robert Southey. Patty is responsible for First Nations and Métis education, EAL, student senates, literacy camps and international students and shares responsibilities for administrator meetings and academies as well as for programming. She supervises the following schools: Arm River Colony, Clive Draycott, École White City, Emerald Ridge Elementary, École Lumsden Elementary, Lumsden High, Milestone, Pense, South Shore, Stewart Nicks. Derek is responsible for learning improvement plans, SCCs, school safety, student nutrition, early years and out-of-area, and shares responsibilities for administrator meetings and academies as well as for programming. He supervises the following schools: Broadview, Dr. Isman Elementary, Grenfell Elementary, Grenfell High, Kennedy Landbank, Kipling, Montmartre, North Valley Elementary, North Valley High, Whitewood, Wolseley High. Lorrie Anne is responsible for programming for students with intellectual, physical, emotional and multiple disabilities. She supervises a team that includes psychologists, social workers, speech/language pathologists, occupational therapists, and behaviour coaches who provide intensive supports to diagnose and address learning gaps. She also supervises the following schools: Balgonie Elementary, Edenwold, Greenall High, Indian Head Elementary, Indian Head High, James Hamblin, Lajord Colony, McLean, Pilot Butte, Sedley, Vibank. Keith is responsible for reporting and analyzing system assessments and student achievement results to target learning needs and interventions to support Division-wide planning and improvement. He also manages the Student Information Records System database and maintains and reports on Division demographics and performance measures. Lyle is responsible for facility planning and management, facility capital projects, risk management, caretaking and preventive maintenance. He leads a team of professional staff to provide safe, healthy, well-maintained and efficient schools and other facilities. Lola oversees all Division financial services ensuring business operations meet best practices, audit and Ministry of Education standards. This includes central accounting, analysis, financial reporting, payroll, risk management, asset management, records management, central purchasing, internal audit and business process improvement services across the Division. Kasia is responsible for building strong relationships with employees across the school division and developing strategies that promote safe, healthy, productive and positive work environments to help deliver the best possible educational services to students. This includes collective agreement negotiation and interpretation, occupational health and safety and compensation policy. Cindy is responsible for providing safe, efficient and reliable transportation services. This includes liaising with schools and families and providing bussing and other transportation services, safety programs, staff recruitment, professional development and capital asset management. Ashton is responsible for providing technology services to serve both education and business needs. This includes strategic planning, implementing and monitoring services, planning, managing and delivering projects, developing enterprise risk and information security management and policies and operating a Division-wide technology service desk. Alana is responsible for creating, implementing and evaluating Division-wide marketing and communications strategies, supporting senior leadership and front-line staff in issues management and for brand and reputation management. This includes overseeing the creation of communications materials, managing media relations, planning special events and maintaining the Division's website. Alana also acts as the Privacy Officer for the Division.